The Oracle 11g database provides a fundamental foundation upon which the basic mission-enabling application processes upon which any size enterprise (private or public), most notably online transaction processing (OLTP) systems, depend. 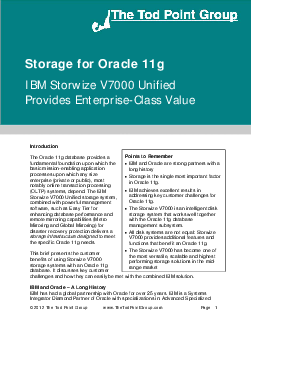 The IBM Storwize V7000 Unified storage system,combined with powerful management software, such as Easy Tier for enhancing database performance and remote mirroring capabilities (Metro Mirroring and Global Mirroring) for disaster recovery protection delivers a storage infrastructure designedto meet the specific Oracle 11g needs. Read on to learn the customer benefits of using Storwize V7000 storage systems with an Oracle 11g database - with discussion of key customer challenges and how they can easily be met with the combined IBM solution.